The Eiffel Tower has played a few roles in its time. Parisian icon, symbol of modernity, industrial archetype of beauty, phallic ode to French identity and radiant beacon for international tourism. But now it is slipping seamlessly into a new incarnation – musical instrument. American composer, Joseph Bertolozzi, is in the process of collecting 2000 samples from the vast structure. Moving around to different points, he is assembling a library of sounds that he will then use as individual musical notes in his composition. By moving closer or further away from joints, using different lengths of metal, different thicknesses and different altitudes, he can evoke different vibrations, and different shades of resonance to help build an industrial scale of sound. Then there’s what you hit it with. That too will naturally influence the tones bouncing back and Bertolozzi has used latex mallets, drumsticks, logs wrapped in wool, amongst many other items to assault the tower with varying degrees of intensity. At that point – it’s back to the studio, the lab or the forge, depending on how you see it to piece together chords, melodies, atmospherics, and of course percussion. "My wife was mimicking the way I play my percussion with my arms flailing and everything. She was near a poster of the Eiffel Tower, took a swing at it and she went 'Bong! '," he said. The organist and choirmaster decided to get some practices in and knocked up a CD called Bridge Music which did much the same thing, but with the Mid-Hudson suspension bridge. The CD reached number 18 on the Classical Crossover Chart in 2009, proving there is a definite market out there for monumental industrial in the classical palette. 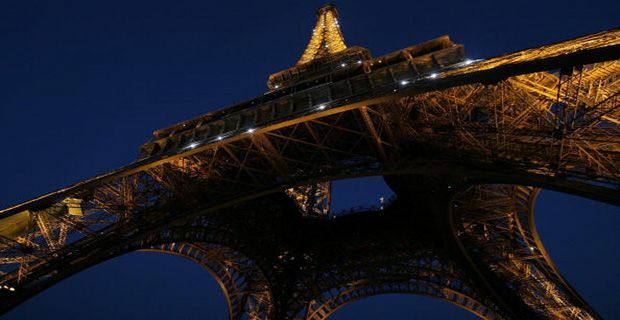 Bertolozzi ‘s ultimate dream is to return and perform the piece live at the Eiffel Tower to celebrate its 125th birthday in 2014. Such a show would require over a hundred musicians with microphones installed all over the iron structure, something that has drawn a muted, almost sceptical response from Eiffel Tower management. But were the CD to top the charts??? ?